1. Holiday Fun Bag - I put all the materials for the day in a gift bag (from the dollar store) to be pulled out throughout the day. 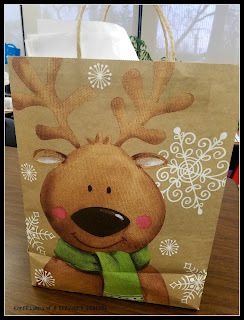 This added surprise element kept my students focused on their behavior since they wanted to participate. 2. The Book - Our days always start with a read aloud. Of course I had to read How the Grinch Stole Christmas! 3. The Grinch Song - We have sung a lot of songs this school year. We even have special purple folders to store all of our songs. This is definitely helping with their fluency. Click HERE to get access to my Google Drive with all the songs we have done so far. I will also add to them throughout the year. 4. Class Book - We then took the lyrics and created a class book. (This is also in the Google Drive for you!) The students illustrated the page based on the lyrics. 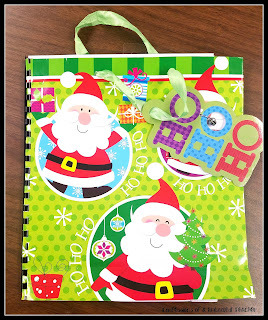 I then bound the book in a gift bag to finish the class book. 5. Growing the Grinch's Heart - We brainstormed a list of good deeds we could do to help the Grinch's heart grow. We took some time to perform these good deeds. Then we added them to our giant Grinch cutout. Special thanks to our school secretary who laminated AND cut this guy out for me!!! 6. 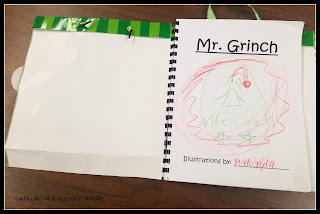 Grinch Directed Drawings - We normally complete Directed Drawings on Wednesdays but did a bonus one this week in order to draw the Grinch. They were adorable! Unfortunately I forgot to take pics. 😢 To make your own, click HERE to find the drawing directions I used. 7. Grinch Movie - We ended the day with the short half hour cartoon of the Grinch. Surprisingly, most of my students had never seen this version! We also completed some really educational activities. They just aren't as much fun to write about!